This immaculate north side home has been professionally updated throughout including updated baths by Fehrenbacher, engineered hardwood flooring, upgraded kitchen, roof with gutter guards, and much more! This home has great curb appeal with a gorgeous landscaped yard with touches by a master gardener, zoned irrigation system and side load garage. The foyer with staircase opens to the dining room with crown molding and hardwood flooring and to the living room with soaring ceiling, engineered hardwood flooring, and a wall of windows providing an abundance of natural light. The updated kitchen will delight any chef and offers an abundance of updated cabinetry, granite countertops, tiled backsplash, top of the line appliances including five burner gas range, planning area, pantry and a large dining area. The spacious great room is open to the kitchen and offers custom coffered ceiling, gorgeous fireplace, and access to the back staircase. The main level master suite offers a spacious master bedroom with a large walk-in closet, and master bath that has been updated by Fehrenbacher with impressive cabinetry, custom tiled walk-in shower and large garden tub. The main level also offers a large laundry with cabinetry and sink and an updated guest bath. On the second level there is a large bonus room/bedroom with large walk-in closet. There are two additional bedrooms on this level also offering walk-in closets. The Jack & Jill bath has been completely updated and offers a custom walk-in shower. Outdoor entertaining and enjoyment is easy with the expansive Trex deck and patios offering an abundance of space for outdoor cooking, dining, and relaxation overlooking the landscaped yard with area for pets and play. 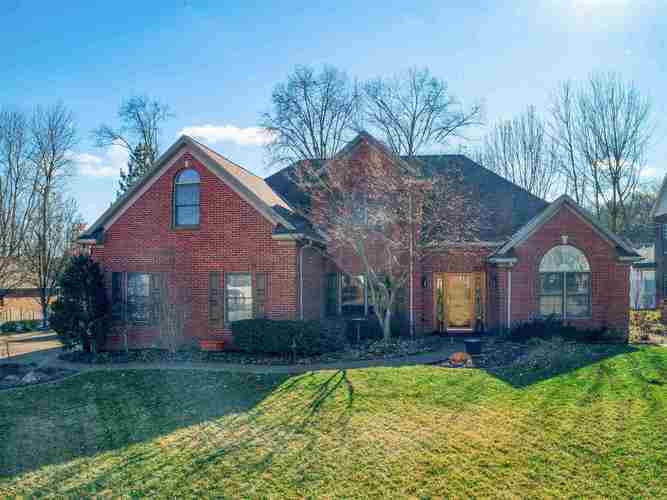 This immaculate home is located in the new McCutchanville Elementary School district and is being offered with a one year home warranty for buyer's additional peace of mind.